When planetary doom threatens, build spaceships! This is why Roland Emmerich had to confound us and NOT build spaceships in his roller-coaster cataclysm 2012. 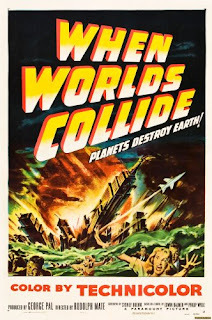 When Worlds Collide is a tamer, more drowsy, if more pleasant affair, concerned not with pseudo-science and earth-shattering Earth shattering but with paternalistic values and aw-shucks romance. A kindly patriarch scientist and a tetchy capitalist build a spaceship to take 50-odd white people off the dying Earth and, in an act of unintended irony, make a new home on the planet whose passing led to the destruction in the first place. They bring chickens, sheep, hamsters, a dimpled boy (and inevitably his dog, which just as inevitably gives birth to puppies as they land), and a small library of microfilmed books. A brief scene shows four frumpy women manhandling leather-bound and marble-papered volumes in the weeks before liftoff. Copies of The Bible, Anatomy of the Human Body, Practical Mathematics, the first volume of an Encyclopaedia, Standard Agriculture, The Story of Mankind, and a Shakespeare await photography on a bookshelf. 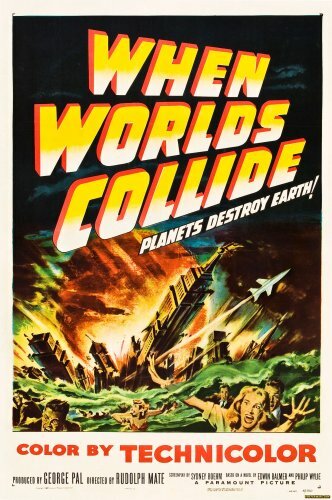 The film won the Academy Award for Best Special Effects in 1951, obviously a bad year for science-fiction cinema. And a bad year for the Western canon too - van Loon's The Story of Mankind was a children's book! A remake, directed by Stephen Sommers (of The Mummy) is scheduled for release this year. PC dictates that there will be a Qur'an next to The Bible and volumes of Sì Dà Míng Zhù next to Shakespeare on the digitization cradle. Expect something postmodern and self-referential too - probably Edwin Balmer and Philip Wylie's 1933 novel on which both films are based.